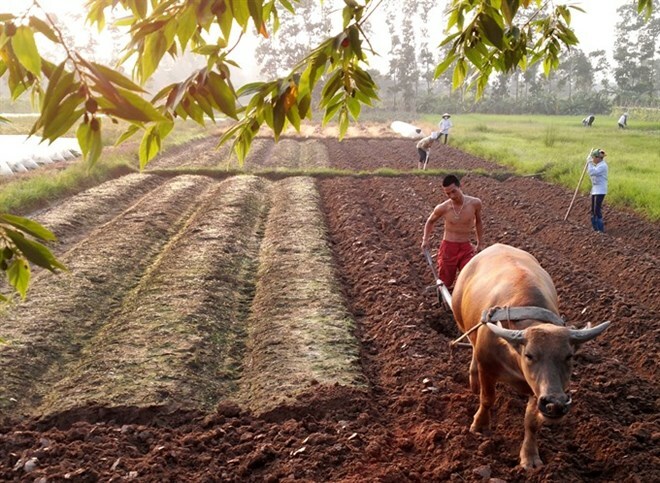 Hanoi (VNA) - An estimated 12.5 million people will be eligible for agriculture land tax exemption, leaving merely 77,000 people still subject to this tax. The tax waiver, provided in a decree signed by Prime Minister Nguyen Xuan Phuc at the end of last month, came in for mixed reviews. While many farmers hailed it, others said there were more pressing problems for their sector. Accordingly, owners – households or individuals – will no longer have to pay tax for the certified agriculture lands in their possession. According to a report by the Ministry of Finance, total agriculture land in the country reached 26.8 million hectares in 2014, 38 percent of which – 10.2 million hectares – were subjected to tax under the Agriculture Land Taxation Law. However, tax is now waived for 6.9 million hectares, or 68 percent of the total taxable agriculture land. Le Van Banh, Director of the Department of Agro-Fisheries Processing and Salt Production, said 70-80 percent of farmers in Vietnam own fields that are less than one hectare wide, so the total amount of collected tax is not considerable. Lifting the tax, on the other hand, will be beneficial to farmers as well as other entities who want to combine fields for large-scale production, he added. To put this into perspective, he added, the loss incurred by mismanagement by Trinh Xuan Thanh when he was at the helm of the State-owned PetroVietnam Construction JSC was tantamount to 30 years of farmland tax. However, Viet said in conclusion, the tax waive would be meaningful to farmers, encouraging production. Nguyen Kim Chuyen, deputy head of the Quyet Thang Co-operative in the southern coastal city of Ba Ria-Vung Tau, praised the recent introduction of many facilitating policies for farmers, including subsidy for irrigation, tax waiver, and low rate loans. Tran Van Hoang, a farmer in Dam Doi district of the southernmost province of Ca Mau, was elated. “The expansion of subjects eligible to land tax exemption is welcome. It shows that the Government cares about farmers and creating favourable conditions for them to have a stable livelihood and be more motivated to invest in agriculture,” Hoàng said. However, regarding unused agricultural land granted to businesses, he urged the Government to either reclaim those land plots or impose a high tax rate on them. Another farmer, Vo Quan Huy, from the southern province of Long An, however, was not impressed. “While tax exemption is always good, I don’t think it will have a notable impact. In reality, the commune’s government has never been too eager to collect agriculture land tax anyway, since it doesn’t amount to much,” Huy said. “Nevertheless, the decree still matters to someone who owns many swathes of land like me. I estimate each year, I can save up some dozens of millions of đồng via this tax cut,” he added. He owns some 1,000 hectares of agriculture land, scattered over the southern provinces of Long An, Soc Trang, Bac Lieu, among others, but many of the plots are registered under another person’s name due to land ownership limits, and he wished the Government would focus more on lifting those limitations. Nguyen Do Anh Tuan, Director of the Institute of Policy and Strategy for Agriculture and Rural Development (IPSARD), said that currently, Vietnam’s agriculture sector is facing a range of pressing problems, such as small-scale and scattered production or unpredictable weather and extreme climate events, even issues with legal documents and policy. According to an IPSARD survey, 63 percent of agriculture businesses said they have difficulties gaining access to land; 70 percent said it’s hard for them to obtain access to credit; and 82.5 percent said they haven’t been covered by agriculture insurance yet. Business as a major player leading the agriculture value chain is being increasingly recognised, Tuan argued. “If we can create an open business environment, developing substantial support policies like ensuring property rights, contractual rights, cutting back on red tape, etc., then businesses will be more interested in the agriculture sector,” he said.